Time has ran quite fast since we left Jackson but the strength of all our great memories is still very powerful in our hearts. This vacation was one of the most wonderful of all we have spent in many places in the world. We are very grateful to you for this success because you took a great part in our happiness. The funny part of the story is that everything began by a mistake: the dates of our stay were wrongly recorded and that became obvious only eight days before our arrival when it looked clear that our house was finally unavailable for us. Then, your action became gorgeous and you really moved heaven and earth to find an acceptable solution of substitution for us. You proposed a few selection of houses, included some proposed by other agencies than yours. You took even time to visit the two last possible choices and you avoid a big deception for us as your visit revealed that the house I was ready to choose was neighbored by a building in construction. The final choice was a wonderful one and the "cabin in the wood" was the exact heavenly retreat we were dreaming of. Thanks again Cora for everything you made for us. We'll never forget it. I spoke so much of Wyoming since we came back home that some of my friends may want to go there for next vacations. Be sure that I'll give your address if they look for something special! The four of us from Lake Tahoe really enjoyed our week here. Cora took care of our every need. The condo was perfect. Location, view were what we wanted. Not to mention the mountain. Thank you! Fantastic place! Felt like home – we don’t want to leave. Great skiing, fantastic snowshoeing, beautiful weather and views and of course drinks and food. You were great to work with. Thanks for making our vacation perfect! We thoroughly enjoyed our stay all of the pots & utensils you could ask for. We found it easier to stay in than go out! Tons of snow – skiing was great! We would definitely come back since this was our 1st trip to JH. Thanks for sharing your very “homey” and comfortable condo. This is our first time here and we love it! This was our honeymoon trip and it was planned over a year in advance. The condo is perfect, cozy and so close to the lift. Our family is here with us and all are staying throughout Teton Village. Thanks for helping make our honeymoon unforgettable! We came to Jackson Hole, WY to get married in the Tetons & have our honeymoon. We have traveled to many places but the beauty here far exceeded our expectations. We highly recommend hiking Cascade Canyon & driving up into Yellowstone (the wildlife there is unbelievable!). The condo is conveniently located & was very comfortable. We had a wonderful stay and hope to return very soon! Great time! We took advantage of many tourist activities… hot air balloon ride, whitewater rafting, paragliding, ATVing and a day in Yellowstone. We also went to the rodeo. The condo met our needs well. Thanks for providing a reasonably priced condo so those of us on a budget can enjoy the area. The condo at Tensleep is within the row of Teton Village condos and very convenient for all activities within the village. The shuttle is easy to catch both to/from the village. This unit is only up one flight of stairs so not too hard after a long day of skiing. It also comes with a convenient ski locker. The washer/dryer is in a community laundry room at the bottom of the building, not in the unit itself. We had intermittent internet service and the lodging company worked to resolve as best they could (in the end seemed like a service issue with Spectrum). The kitchen is updated (as are the bathrooms which are sized appropriately for the condo) but if you have two cooks you both must be deft at 'spinning' to stay out of each other's way! Jackson Lodging also partners with Key Concierge which was very helpful in making restaurant reservations, and other activities outside of skiing. Great stay, nice place. Will come back. Overall, a great place to stay. Support from management was top notch. Perfectly fit our needs for a family of four with two teenage boys. Great property just inside the south entrance to Teton National Park. The "newer" side of the cabin was great for late evening gatherings around the wood burning stove listening to old 33's on the turntable and playing Trivial Pursuit. The original cabin contained a well appointed bath with all the necessities, a well stocked kitchen to cook whatever you desire and the main bedroom with a super comfy bed. Highly recommended to anyone who is looking for that perfect "rustic" cabin with many modern amenities. If your lucky you might even see the abundant wildlife in the neighborhood. Thanks to the the entire family for sharing their place with our family. Great Condo with Lots of Space. Seven healthy seniors stayed in this great condo. Three male friends in their early 70's used the loft with ease. All the beds were comfortable. The location was great, and the condo was spotless. The kitchen was large and well-stocked. It was a wonderful experience. I have been to this cabin twice and count each time as an unforgettable experience. It is a rare inholding within the park and the fact it can even be rented is extraordinary. The property is a mix of rustic and modern with a lovingly hand crafted original cabin and beautiful expansion seamlessly joined to form a warm, family friendly home under the peaks. The views from the living room and loft beds are spectacular. One of my favorite memories from the last trip was sitting with my wife in the early morning (tea in hand) on the front deck watching a thunder storm gather and spawn huge rainbows over the Grand Teton. The kitchen is a galley with a table nook and provided everything we needed. The back bedroom in the original cabin is quiet and cozy. The bed was very comfortable for my wife and I. The kids enjoyed being in the big (and safe) loft. Trails right off the driveway connect with the major trails in the valley and you can be in the mountains in no time. It is a short drive or bike ride to Teton Village and getting into town requires a car but is an easy drive. The big lakes are also a short drive in the other direction which makes this location so much better than being in town. If you want quiet, a place where the kids can explore within sight of the cabin, no traffic, and fantastic views this is the spot. Very nice and clean condo. The condo was as described. Kitchen had everything we needed for having breakfast in and a few evening meals. The location is very convenient to the national park entrance and an easy walk to Teton Village. We took advantage of the washer and dryers which there were four of each and they are only $1.00 to use. Daytine temps were in the 80's and evenings into the 40's but we could still sleep with our window open. The beds were comfortable. Nice relaxing property. Property was clean and well maintained and Close to Jackson Hole center. Serene setting with plenty of room for large or extended families. Loved it! This home in a quiet neighborhood welcoming to wildlife is perfectly situated in between town of Jackson and Grand Teton National Park/Jackson Hole Ski resort. 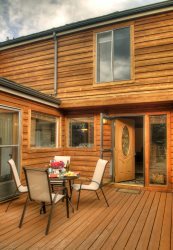 Comfortable seating and bedrooms; fully-equipped kitchen; great family table for community; and awe-inspiring views of Tetons from living areas. First morning from the kitchen window, we watched 5 stately elk cross the golf course. Outdoor deck with fire pit and lots of seating was wonderful in the evenings. Kids had fun in back den with Xbox and toy loft. Great for a family gathering in a beautiful setting or a base of operation for exploring Jackson Hole and Yellowstone area. Great, house was perfect for 2 families...loved the bunk room. Very nice and worked well for our group of 4 adults and 4 kids. Beautiful House with great views. A great house for a family gathering. The location is perfect, close to the airport and private. I would highly recommend this property. Wonderful setting for a family vacation! We loved this location- remote from other homes but still near Wilson and Jackson. The house was perfect for our extended family that included preteen children. Our only concern was that the door to the microwave was broken; other than that, everything was great! Will certainly be back! The house was very beautiful and provided my family with more than we have in our home. Everyone was very comfortable in their own bed/ bathroom. Countless numbers of deer provided an ongoing show morning & evening. A truest great place. Clean, quiet, comfortable! The place was clean, quiet, and comfortable just the way we like it. The location outside of town was perfect. Everything worked, we cooked several meals and grilled on the deck. We would go back to this place, and easy choice. Perfect home for the whole family! We've always dream of visiting Yellowstone/Jackson Hole with our daughters, family, and friends...12 of us from Nashville....words cannot express how much we appreciate your home...it was a gift...the layout, views, deck, kitchen, and on....whoever designed your layout nailed it. Don't hesitate renting this amazing home. Thank you for sharing it with us....forever grateful. The Adam's family retreat was a fantastic place for our Law School friends reunion. We were 2 couples and 4 individuals and the 6 bedrooms with ensuite bathrooms gave us each the room and privacy we needed. The large dining room (huge table), kitchen, deck and living room gave us plenty of room to be together comfortably, too. The views of the sunrise and sunset on the Tetons and the nature on the golf course never grew old. There were deer, bison, Canada geese, beavers and Falcons right outside our door on walks through the community. Jackson Hole (with food, bars and shopping) and Jackson Hole Airport were very convenient. Note* If you fly there and rent a car, make sure your pick-up /drop-off are AT the airport.. Not Shuttled to JH! Early morning departures are very inconvenient with a 20+min shuttle involved!) The South entrance to Yellowstone Nat'l and Old Faithful, the Elk Refuge, Snake River Rafting, Dude Ranches and skiing (in season) and numerous other natural wonders are a very easy day trip from this home. Very tidy unit with great access to the village via shuttle bus. Loved it. Spacious, well-stocked home. Fantastic house - plenty of bedrooms, every spice you could want to cook with in the kitchen, high chair, cribs and everything necessary for kids as well. The cabin is a unique property in Grand Teton National Park. It was very cool to hear the history of the cabin and the fact that the original part of the cabin where the bedroom, kitchen and bathroom is was built in 1920! The wood floors are the original as well as all the logs. Love the feel of old wood, in Jackson in a 100 year old cabin, talk about perfection. The full size bed in the master was not ideal and we would have preferred a Queen but we made it work. The loft was perfect for our two kids, I was a little worried that the 5 year old would fall on the stairs but it has double railings and no problems there. The newer build on the cabin has the loft and the HUGE living/dining room. It's a nice light colored wood with natural light. It was wonderful to play games and sit around in the great room with the fireplace going. I was surprised that there was WiFi at the cabin! Great reception, almost wish it didn't come with internet :D Bathroom has a new shower, the bathroom is a little small but they provide lots of towels and amenities enough for our family of 4 for the week and half we were there. The miles and miles of hiking trails just down the road were awesome. The road up to the cabin was exactly as the lady who booked us said. It is a private dirt road that winds up a bit to get to the cabin. You need a vehicle with higher clearance, standard SUV is what we rented and it was perfect. Sat on the deck everyday and couldn't count how many birds we saw, lots of little hummingbirds. We had a little chipmunk friend come in the cabin when we left the doors open but there staff came up and got it out right away. One morning we walked out to find a Cow Moose and her calf in the back yard! We will be back to this cabin and want to make it a regular yearly trip! Christmas Perfection. Absolutely loved the home and was perfect for Christmas vacation with the family. We had children 6-10 with us and they loved the downstairs room with the bunk beds and couches. It was great to have the hot tub on the upper deck and the fireplace was perfect after a cold day. Great family vacation. This is a very beautiful location. It is out of the hustle and bustle of Jackson but close enough that you can go if you want to. It was a great base to start our exploration of the Grand Teton and Yellowstone National Parks. Only comment that I have is, laundry services were a nice feature, but placement of cabinets make the washer hard to use. Thank you for a wonderful stay. Excellent!!! We had a superb time this past week. The skiing was great, and it was quite relaxing having such well-appointed wide open space in your home at the end of the day. We cooked a few dinners and just enjoyed the tremendous vistas, plus an occasional curious deer sauntering by. Lovely visit. Nice house, well stocked and awesome views! Our family had a wonderful visit to this lovely home. It is only 10 minutes to Jackson Hole where we had lovely dinners, watched a rodeo and had fun shopping. We also make a day trip to Yellowstone that was so very memorable. The home is so well decorated and had everything you will need to make your visit so comfortable and amazing. We will be back for sure!